On Friday, Feb. 16, 2018 at 1:30 pm EST, the U.S. Dept. of Justice held an important press conference. Mainstream media called it a decisive turning point in the findings of an 18-month long federal investigation into President Trump’s possible collusion with Russia to affect the outcome of the 2016 U.S. Presidential election – a topic widely known as “Russiagate.” Deputy Attorney General Rod Rosenstein presided at the event. The FBI-led investigation has been ongoing since late July 2016, initially under Special Counsel James Comey, FBI Director (2013-2017), and continuing under Robert Mueller, FBI director (2001-2013). Trump fired Comey as FBI Director May 9, 2017, and 8 days later Mueller was appointed Special Counsel. He was not present at the Feb. 16, 2018 press conference. In addition to some serious face-saving regarding the Florida school shooting, the FBI was under pressure to produce some hard evidence of the Trump-Russia collusion in the 2016 Presidential election, especially when such a lengthy and expensive investigation was combined with relentless media hysteria: If they could find Trump guilty of Russia collusion, they could remove him from office and once and for all prove that Russian interference cost Hillary Clinton the election. Prior to this, on Oct. 30, 2017, Special Counsel Robert Mueller announced criminal charges against former Trump campaign manager Paul Manafort and his business partner Rick Gates. Their business dealings were mainly in the Ukraine from 2006-2008 and extending through 2014, thus preceding the 2015-2016 U.S. election season. On Feb. 13, 2017 Trump’s National Security Advisor Michael Flynn was forced to resign after only 24 days in office. However, most of these previous indictments are likely to be thrown out of court due to the illegal surveillance and unmasking of private citizens ordered by the Obama administration on Trump and his team. This surveillance lasted through Oct. 2017, almost 10 months into Trump’s first year as U.S. president. We now know from the Nunes FISA memo released Feb. 2, 2018 that the Obama administration requested permission from the FISA Court (Foreign Intelligence Surveillance) to do surveillance on Trump and his team, and that the request was based largely on “the Russian dossier” – a fabricated document purchased for over $12 million by the Clinton campaign and the DNC (Democratic National Committee). During the Feb. 16, 2018 press conference Deputy Attorney General Rod Rosenstein cited 13 Russian nationals and 3 Russian companies for committing “federal crimes while seeking to interfere in the US political system, including the 2016 Presidential election.” Some of these activities started in June 2014, well before most U.S. Presidential candidacies had been declared. And of $100,000 worth of Facebook ads, 56% of them aired after the election. Responding to a journalist, Rosenstein said: “There is no allegation in the indictment of any effect on the outcome of the election.” He also said: “The Russian conspirators want to promote discord in the United States and undermine public confidence in democracy. We must not let them succeed.” These operations were unsolicited and pro bono, and included posting derogatory information on a variety of candidates, and organizing both pro-Trump and anti-Trump rallies. A brief review on how to read South Indian charts. This announcement chart indicting 13 Russians and 3 Russian companies has the dual sign of Gemini rising in Ardra nakshatra, ruled by the tear drop, and associated with suffering, storms and the deity Rudra. Media coverage on the event was split two ways, mostly the former: 1) This is the start of something big; and/or 2) This represents the winding down of the Mueller probe, as he still has no conclusive evidence tying Trump and his team to colluding with Russia to affect the outcome of the 2016 Presidential election. It is a Friday, Venus-ruled day, shortly after the partial solar eclipse the previous day at 3:01 Aquarius (using Mean node; 2:29 Aquarius using True node). A cluster of 4 planets occupy the 9th house, which is commonly associated with courts and the judiciary, though in this chart the 10th house also assumes this role. Sun and Mercury are very close to the exact eclipse degree, while Venus and Moon appear later in the sign of Aquarius. In the classic work Prasna Marga, Vol. 1, it is said that “for three days from the time of the commencement of solar or lunar eclipse, it is inauspicious.” Auspiciousness in this case would refer to the successful outcome of the announcement, i.e. conviction of the 13 Russians and the 3 Russian companies who have been formally indicted on this day, and also presumably – for the primary stated purpose of the investigation – finding some concrete evidence of a Trump-Russia collusion impacting the 2016 Presidential election. Close proximity of Sun and Mercury to the eclipse degree gives some power and notability, but also some vulnerability, especially with a waxing Moon just 11 degrees separating from the eclipse degree – a still almost invisible Moon in the heavens. Since Mercury rules the Gemini Ascendant, its position in the chart is very important. Being within one degree of the Sun is also said to give Mercury some extra brilliance in powers of intelligence and/or communication. However, this Sun at 3:55 Aquarius is within one degree of its Mrityu Bhaga degree, at 3:00 Aquarius. Therefore, the Sun is at a fatal degree and capable of destructive effects. Being closer to Mercury than any other planet, we have to consider whether Mercury could be adversely impacted by the Sun. Mercury represents the Dept. of Justice, and most especially Special Counsel Robert Mueller and this investigation. Placement in the 9th house of good fortune reflects the power of the U.S. Dept. of Justice, both in its ability to initiate and undertake a federal investigation of a sitting president, and prior to that – from July 2016 – to investigate and surveil Trump and his team while he was both a candidate and President-Elect. The outcome of the event can be read in even more detail when we analyze it as a Prashna (or Horary) chart. For disputes and litigations, House 1 shows the initiator of the action, House 7 is the opponent or the open enemy, House 6 is secret enemies, House 4 is the judgment, and House 10 is the authority or the judiciary. Right away we see that House 7 has much more power than House 1, since an angular planet has more power. (Angular = in Houses 1, 4, 7, or 10 from the Ascendant.) With Saturn in the angle being stronger than Mercury in a trinal house, Saturn in the 7th house poses great difficulty for the Dept. of Justice (House 1) since Saturn is a classical malefic planet strongly situated in the 7th house, also its Digbala position (best possible angle for Saturn). Mercury and Jupiter become the two most important planets to examine in this chart, also the condition and occupants of Houses 1 and 7. We already know that Saturn in House 7 gives more power to the opponent (the Russians, in this case). The planetary lord of House 7 is Jupiter, which is well placed in House 5, a trinal house, and near its Stationary Retrograde degree of 29:07 Libra. A slower moving planet approaching its station has added strength, and Jupiter turns SR on March 9, 2018. Jupiter also resides in its own nakshatra of Vishakha. Mercury resides in another trinal house (House 9), but is weakened by being so close to the solar eclipse degree Feb. 15, 2018 and to a Sun within one degree of Mrityu Bhaga, as mentioned previously. Jupiter’s relative strength gives advantage to the opponent (House 7) and the authority (House 10). Though it appears that the U.S. Dept. of Justice is the authority here, this may be a matter that has gone beyond what the U.S. Dept. of Justice can handle, either because the Russians cannot be extradited, or because the issues of the investigation itself are now winding down for whatever reason. We see this from Jupiter being so late in the sign of Libra and not connected by allowable aspect to the other planets. Also, its sign lord Venus is well placed in House 9 just beyond combustion range, while the Ascendant and Ascendant lord Mercury are both aspected by two classic malefic planets, Mars and Saturn. Even though the Ascendant and its lord also receive a positive trinal aspect (120 degrees) from classic benefic planet Jupiter – it is too wide an orb to give any real countervailing protection from Mars and Saturn. A general principle for litigation charts is that Mars and Saturn aspects to the Ascendant indicate that the initiator of the actions does not have good intentions and may be involved in an unjustified action or even a crime. Jupiter’s wide aspect slightly modifies this edict, but Saturn’s opposition is within half a degree, while Mars is within 6 degrees of an exact 8th house Parashari aspect to the Ascendant. Saturn’s opposition aspect to the Ascendant occurs in both the birth chart and the Navamsha chart, confirming the strength of both the aspect and Saturn’s role in the 7th house. In addition, in a legal battle, we examine the Ascendant lord and the 7th lord to see which planet is aspected by the 10th lord. The person or entity represented by that planet is considered not justified or true in his intentions. In this case Jupiter (the Russians) is both 7th and 10th house lord, and Jupiter aspects the Ascendant lord (Mueller and his team), though widely. Further proof of the opponent’s power in this chart comes from the bindu count in the Sarva Ashtakavarga system, which gives a much higher number to the 7th house (the opponent: the 13 Russians and 3 Russian companies, backed by the Russian government) than to the U.S. Dept of Justice and Mueller’s team (the Ascendant, and initiator of the litigation). Sarva = all, and Sarva Ashtakavarga gives the total number of bindus, or points, accumulated from each of the 7 classical physical planets in each house (excluding Rahu and Ketu), measuring a planet’s strength in each sign by 8 sources of energy. It is most often used to measure the strength of transiting planets in a birth chart, but is also useful in Prashna and other types of charts. Each planet contributes from zero to 8 bindus, zero being very weak and difficult, while 8 is outstanding. The Russian government (the implied open enemy or opponent: 7th house) has responded to the indictments by calling them “a lot of blather.” Further, it is unlikely that any of the accused will be extradited from Russia and face charges in the U.S. The 6th house of secret enemies is likewise very strong, containing the lord of the sign of Scorpio: Mars. As mentioned, in this type of Prashna chart dealing with a dispute or litigation, two classic malefic planets aspecting the Ascendant define the U.S. Dept. of Justice as the weaker party, and put them at a distinct disadvantage in this situation. Mercury so close to the Sun (36’, just over half a degree) brings public attention on Feb. 16th to the Russiagate issue, to Deputy Attorney General Rod Rosenstein, and by his pivotal role – to Special Counsel Robert Mueller. Well placed in the 9th house, even if weaker than Saturn, as described, Mercury does not make any effective connections to planets other than the Sun, according to Prashna rules. Planets can make applying and separating aspects to each other, but in Prashna charts they have to be within a certain defined range of degree orbs. If they are applying and within Deeptamsha range, something can work out, depending on the type of aspect; if separating and within Deeptamsha range, the action is done and nothing further can happen. If there is no connection, there is also no effective outcome, as there is no ability to act. These degree ranges are called Deeptamsha. We add the Deeptamsha ranges of the two planets involved, and divide by two. If they are within range of the Deeptamsha, this creates a connection called a yoga, either the Ithasala yoga (applying aspect), or the Isharapha yoga (separating aspect). 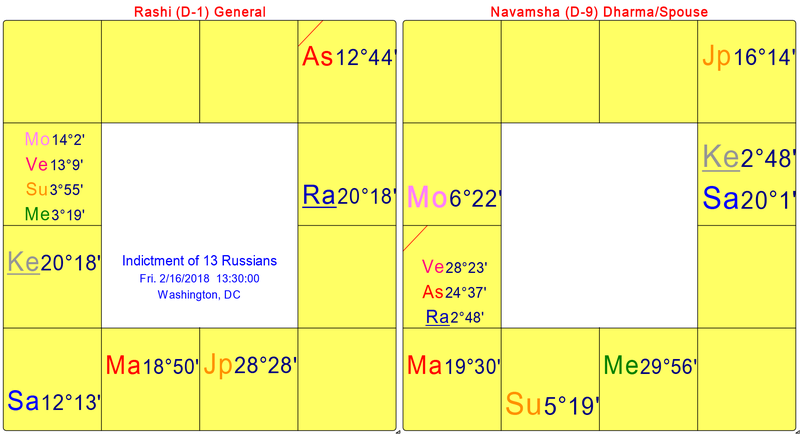 The Deeptamsha ranges are as follows: Sun: 9 degrees, Moon: 12 degrees, Mars: 8 degrees, Mercury: 7 degrees, Jupiter: 9 degrees, Venus: 7 degrees, and Saturn: 9 degrees. (Rahu and Ketu are not included.) Tajika aspects include the conjunction, semi-sextile, sextile, square, trine, and opposition. The sextile and trine are considered the best aspects for a positive outcome. Parashari aspects include the 8th house aspect from Mars. And we see that though Jupiter forms a benevolent trinal (120 degree) aspect to the Ascendant and 4 planets in Aquarius, they are all outside of the Deeptamsha range. Similarly, Jupiter and Mars as well as Jupiter and Saturn are outside of Deeptamsha range, and cannot interact with each other. Ascendant lord Mercury (U.S. Dept. of Justice) is also outside of Deeptamsha range to be able to aspect any other planet except for the Sun. We are especially interested to know whether Mercury will aspect either Mars, Jupiter or Saturn, since Mars and Saturn are malefic planets located in houses associated with the opponent or the enemy. If there is an interaction of the planets by Deeptamsha range, notably by applying aspect (Ithasala yoga), then there is an opportunity to work towards a conclusion of some kind. Jupiter is planetary ruler of the 7th house (the opponent) and the 10th house (the authority or judiciary). Add the Deeptamsha ranges for Jupiter (9 degrees) and Mercury (7 degrees): total = 16, divided by 2 = 8. Mercury is at 3:19 Aquarius. Add 8 to that and we get 11:19. Jupiter is at 28:28 degrees Libra, a difference of 17:09 degrees. Thus, there is no interaction between Mercury and Jupiter. Might the Moon help out with a Kamboola yoga? This occurs when a planet connects within the Deeptamsha range to the Moon, and the Moon to another planet at a higher degree, also within the Deeptamsha range. In this case, we examine Mercury to Moon to Jupiter; but that does not happen either. And while Ascendant lord Mercury is at the lowest degree in the chart, at 3:19 Aquarius, Jupiter (7th house lord) is at the highest degree, at 28:28 Libra. So the Dept. of Justice is unable to catch up with the 13 Russians and the 3 companies to convict them, it would seem, as these Russians (backed by the Russian government) are out of range to be caught. They are safely back in Russia and not likely to be extradited to the U.S. Similarly for Mercury and Saturn: Add the Deeptamsha ranges for Saturn (9 degrees) and Mercury (7 degrees): total = 16, divided by 2 = 8. Mercury is at 3:19 Aquarius. Add 8 to that and we get 11:19. Since Saturn is at 12:13 degrees by sextile (60 degree aspect), no aspect between Mercury and Saturn can be completed. Saturn is just out of range. We can go through this same process with Venus and the Moon, and we see that they are just separating from a sextile with Saturn: a possible compromise that is just disappearing. What remains operative is Moon and Venus moving into a negative square aspect with Mars (in the house of secret enemies), and Saturn moving into a semi-sextile with Mars. The latter is considered a weak positive, and is not often used. In any case, Saturn is much slower-moving than Mars, and will never catch up with it as long as Mars transits Scorpio. Another interesting issue to examine is the financial factor. 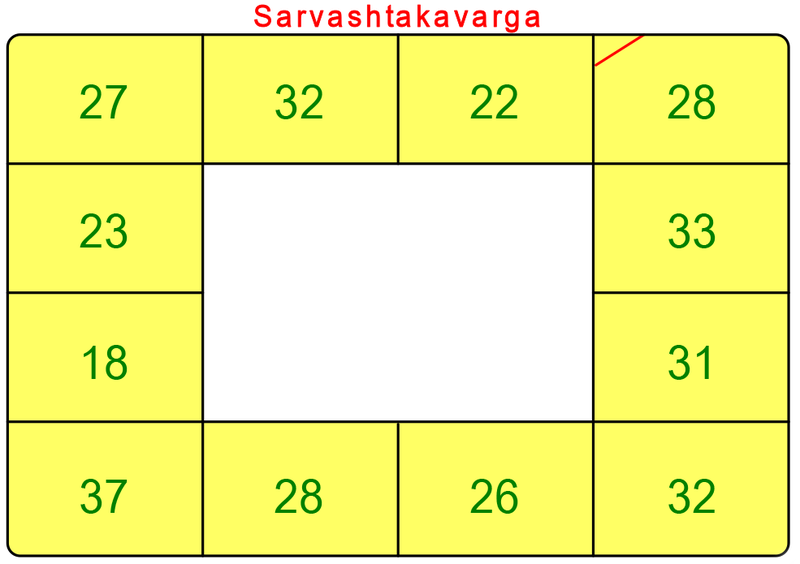 Counting from the 7th house, the 2nd house of finance is the weakest house in terms of Sarva Ashtakavarga, at 18 bindus. (see the Sarvashtakavarga chart above) The 13 indicted Russians were spending ca. $1.2 million per month by June 2016, which the U.S. Dept. of Justice presents as a serious expenditure. But by comparison to the money spent by the two major candidates and their respective parties, it is a truly insignificant amount. Hillary Clinton officially spent $2.1 billion on the 2016 Presidential election, though unofficially more like $3.1 billion with the infusion of cash through diverse channels from Eric Schmidt, former Google CEO, and investor George Soros, among others. Donald Trump spent $500 million. He also received over $2 billion in free air time from the same media who turned on him as soon as he became the GOP nominee. From the Gemini Ascendant, the 2nd house of finance in the Prashna chart pertains to the U.S. Dept. of Justice, which for Mueller’s investigation has now spent somewhere over $10 million. He spent $7 million alone between May and Sept. 2017. After 18 months $10 million is probably a conservative estimate. But since the 2nd lord (Moon) is in the 9th house close to the 9th house cusp, this forms an excellent Dhana and Raja yoga (yogas of wealth and status), reflecting the reality that the Dept. of Justice and Special Counsel Mueller have large amount of funds at their disposal to pursue this investigation. By Sarva Ashtakavarga, House 2 from the Ascendant has a relatively high bindu count at 33, especially in comparison to the 18 bindus in House 2 from the 7th house, the lowest number of bindus in any house. So we see that the chart of the Feb. 16, 2018 press conference indicates a lot of show of power and money in the U.S. Dept. of Justice’s pursuit of the 13 Russians and the 3 Russian companies, but one that is likely to lead nowhere. Whether Mueller’s probe will continue unabated is probably beyond the scope of this chart, but it is still significant that this day and time were chosen to make a major announcement and to reinstate the power of the FBI, the Dept. of Justice, and their pursuit of the Trump-Russia collusion. Russiagate looks to be part of a pre-determined and official narrative seeking to enable regime change in the U.S., even if no evidence of Trump-Russia collusion has been found after 18 months of federal investigation. In 2002 and 2003 the mainstream media told us repeatedly and hysterically that there were weapons of mass destruction (WMD) in Iraq, even when no WMD were ever found. Memos from President George W. Bush show that he had already decided by July 2002 to attack Iraq. In the meantime, WMD were used to convince the American public. The same mainstream corporate media that led the drumbeats of war for invasion and regime change in Iraq are now equally determined to target Trump, if not on Russia collusion then on obstruction of justice. Anti-Russia frenzy is more and more accelerated so that Putin and most Russians will be seen as villainous enough to target for a war. Doing business with Russia or having dealings with Russians are now the new raison d’être for being a suspicious or dangerous person, much like the McCarthy era of the 1950s. This is the backdrop for the press conference on Feb. 16, 2018. Aditya, Vinay, Practical Ashtakavarga, 2011. Kapoor, Deepak, Prashna Shastra: Scientific Applications of Horary Astrology, Volumes 1 & 2, 1997. Prashna Marga (written ca. 1649 A.D. in South India by an anonymous Brahmin astrologer from Kerala, India), Parts 1 & 2, Translated & notes by B.V. Raman, 2nd revised edition, 1991, 1992.